Without a doubt, we are living in a big data world where businesses are amassing unprecedented stores of information about their programs, campaigns and customers. Yet, amid these petabytes of data lie stories of success that paint a compelling picture of business in the twenty-first century. Organizations that have harnessed the ability to unearth these stories are effectively using data as a means to advance their organizations to success. They’ve achieved this by building cultures of measurement that recognize the value of data at multiple levels within their companies starting at executive management and cascading through to tactical specialists. Yet, nurturing a program of measurement that has a profound impact on an organization in this way requires time, diligence and planning. Most organizations are not adequately equipped to leverage the measurement technologies they own for conducting data analysis and using data to drive change within their organizations. Most often, individuals struggle to deliver insights using flawed processes or via short-sighted strategies. Data remains locked within departmental silos and never gains the chance to permeate throughout an organization. Organizations that have a willingness to advance can evolve their companies to take advantage of data and measurement technologies for competitive advantages. 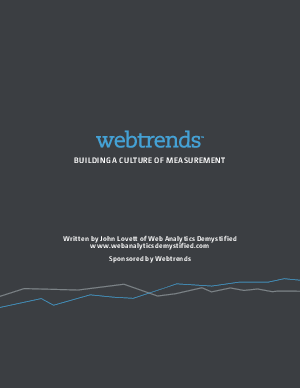 Throughout this paper, we share examples of how organizations are building, nurturing and succeeding with cultures of measurement within their respective organizations for substantial gains. We also detail methods by which you can build a culture of measurement within your organization that includes strategy, process and most importantly results.